Watercolor book set from the Starvin' Artist. Watercolor lessons at home. This is the perfect introductory kit for anyone aspiring to learn the captivating art of watercolor. The kit not only provides all the art tools needed, it also includes an inspiring project book that will teach you how to use those materials effectively. The project book covers the essentials of watercolor painting, from basic strokes and special techniques to more in-depth concepts such as color theory. It also features five complete step-by-step watercolor lessons to follow and learn. With clear instructions, helpful tips, and step-by-step illustrations, these projects are sure to help beginners find the artist within. And with everything you need right at your fingertips, you’ll be amazed at how quickly you can learn to create your own beautiful works of art in watercolor! 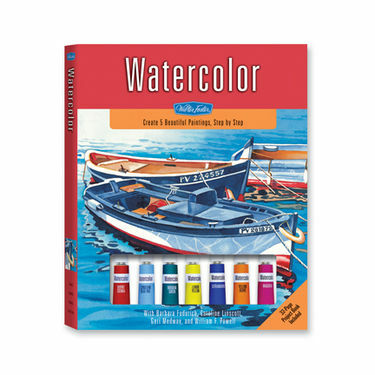 Hardcover 9" x 11.25" case includes 32-page paperback book, 8 tubes of watercolor paint, plastic paint palette, round paintbrush, flat paintbrush, sea sponge, sea salt, and watercolor paper. A great retirement art kit. Keep on painting in Chicago.